Well, we've got ourselves a giant robot fighting game here, kids. You know me and my love of giant robot fighting games. 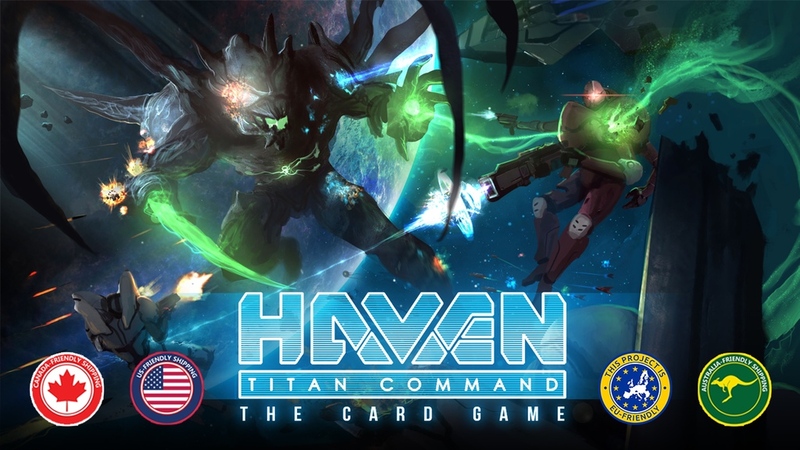 This one's called Haven: Titan Command. In it you'll make your own customized Titan fighting robot and do battle against your opponents. Fight in exotic locations all across the galaxy as you look to be the last one with a working bot at the end. In the game, players will pick one of the four core Titans that represent each of the four factions. Using the robot and your pilot as a starting point, you'll then construct your deck of cards that you'll use in combat. The base game comes with 190 cards split across the 4 factions, along with cards that aren't part of any faction (and thus can go in any deck). Using said deck, you'll create your custom robot as well as decide what place you want to fight in. You'll have to be careful, though, as letting your opponent jump into battle first before you're prepped, or having to fight on a battlefield of their choosing can put you at a bit of a disadvantage right off the bat. Then, duke it out for supremacy. The Kickstarter campaign is up and running now. They're about 1/3 to their goal with still 23 days left on the clock.